You can see some of my recent work on this page. They are my favorite shots and I like to tell you a bit more about the picture. Where did I take it, why did I choose the subject, what was the story behind the scene ... Those kind of things. connection between the furry colar of her coat and the fur of the dog is more clear for me. Rain gives interesting opportunities, for instance how people dress. On the Rotterdam Binnenrotte market I noticed this woman in old-fashioned rainwear. A more new-fashioned version can be seen in the background. I followed this lady for a while, walked past here, turned around and made the photo. So very happy with this photo. 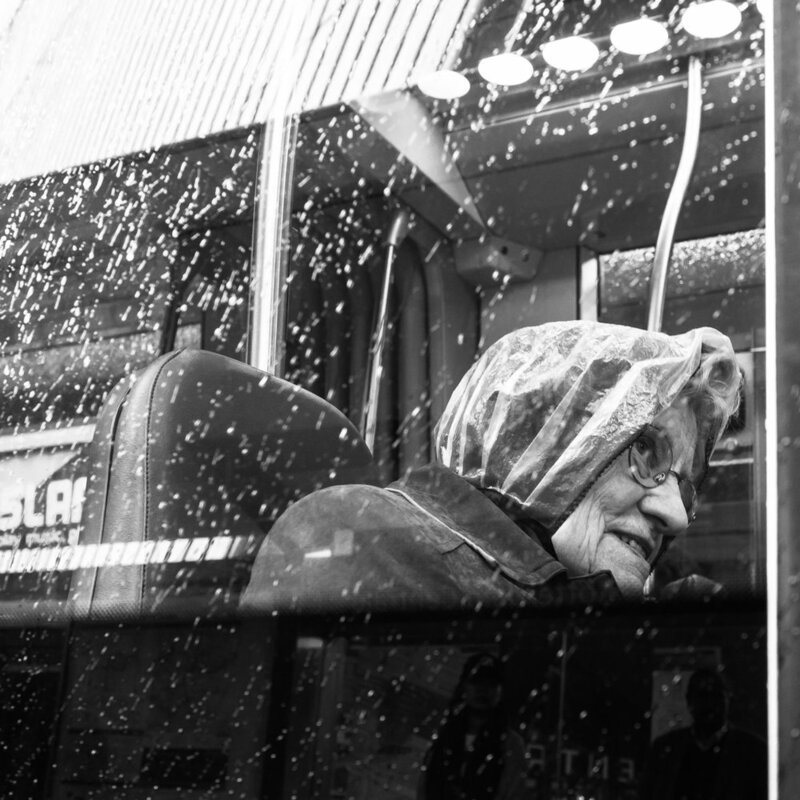 I like the colors, the rain on the tram window, her kind face and the reflections. I made this image in Rotterdam in September 2018. Although I don’t like rain at all without my camera, I try to get the most out of it with my camera. I made this photo during my Advanced workshop street photography in Rotterdam in September 2018. Although her face is a bit visable under the umbrella I think she is not really recognisable. Therefore she can be part of my Undercover series. During my Advanced workshop I ask my participants to also look for Undercover shots. They find that a challenging assignment. I made this photo in august 2018 near Rotterdam Central Station. This nice woman was busy getting something out of her trolley. In a split second I saw the text on the building behind her. Lucky me to create a funny combination between the text and her small trolley business. I am a Feyenoord fan since I was a kid. I grew up in the neighborhood of the famous Kuip, the stadium of Feyenoord in Rotterdam. 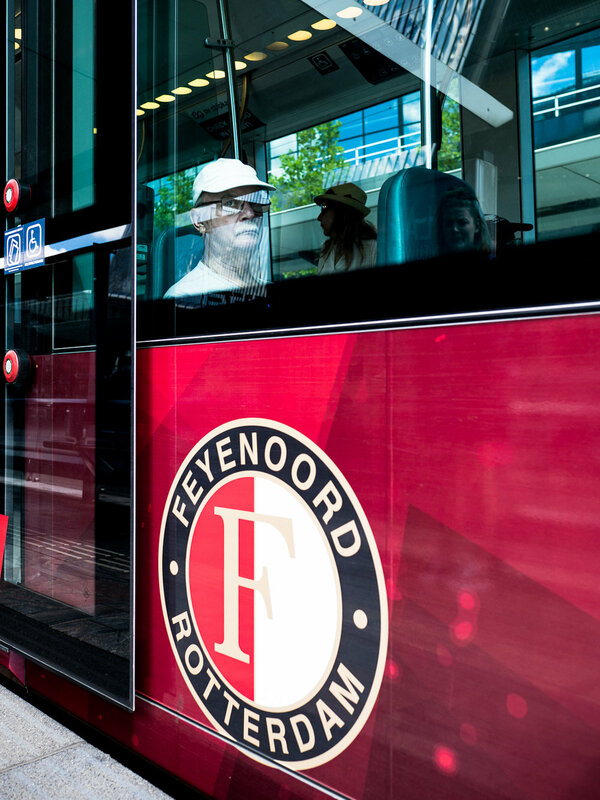 What could be cooler than travelling in a Feyenoord tram, this guy must have thought. Although he saw me, he did not flinch. Welcome to my Glassy series. August 2018. I saw this cool guy walking near the Rotterdam Central Station. I intended to make a candid shot, but he was with some other people and I didn't get a good chance. So I asked him if I could capture the back of his head. "No problem" he said. While setting the auto focus point I saw the text on the lable of his t-shirt. A perfect match :-) A beautiful contribution to my Street Fragments series. August 2018. This is Holland, this is Amsterdam! Dogs are transported in many ways, preferably by bike in the city center. I made this photo in July 2018 on a very warm day. In the summer I see myself post-processing more photos in color than I do in the winter. This French bulldog deserves a place in my Street Dogs series. I made this portrait in Rotterdam during a private workshop I teached to a very nice couple. 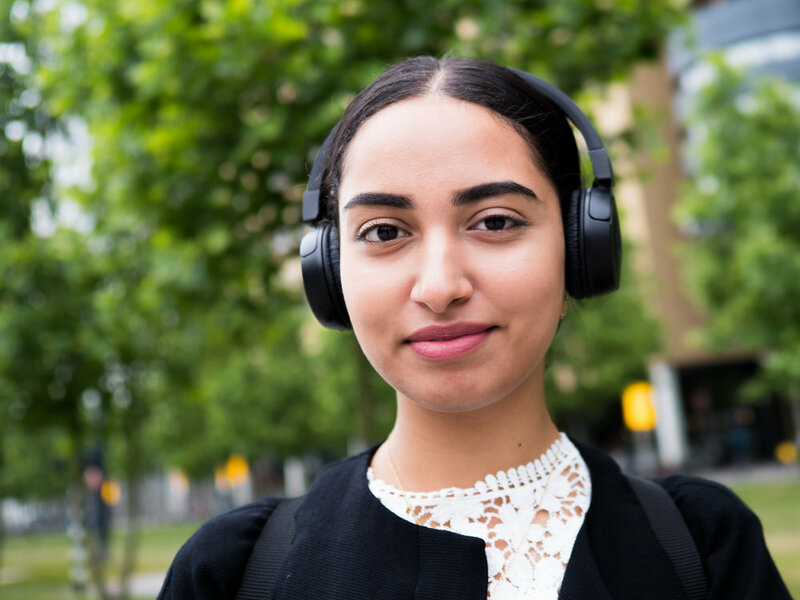 More than 175 different cultures live in the city of Rotterdam. This beautiful young lady was happy to pose for me. She didn't live in Rotterdam but came from Dordrecht. You can see that the 17mm 1:1.2 PRO lens is also perfect for portraits like this. Note the perfect bokeh! More street portraits in my Street Portraits series. I made this street portrait during a workshop I teached in Amsterdam in corporation with Olympus and Fotogram in January 2018. I was lucky that Olympus brought the 17mm 1:1.2 PRO and I had the opportunity to use it for a couple of hours. The bokeh is so good! I asked the guy if I could make a portrait of him. I liked the smoke he produced and I encouraged him to create a big cloud in order to cover his face. That made it possible to add him to my Undercover project. This scene also happened on January 1st during the New Years Dive in Zwolle. It was a couple of minutes before the dive. These four cow girls/boys were posing for another photographer. You can see that 3 of them didn't look at me. I am not afraid of getting my piece of the action and one of the girls decided to pose for me. Literaly the first photo of 2018 taken on January 1st during the New Years Dive in my hometown Zwolle. The Milligerplas is a small lake in the backyard of my house. I guess 10 photographers were lined up in front of the water (local press and me). It's impressive when you hear the starting shot and all those people come running towards you. I used slow burst to capture as much as possible action. I love the excitement on every ones faces. One of the last photos I took in 2017. On my way to the Dutch Photo Museum in Rotterdam to visit the Bruce Davidson exposition. Location: subway station Wilhelminaplein at Rotterdam. Shot with Olympus OMD1 Mark 2 and Olympus 17mm f/1.8. Photo taken in Amsterdam in September 2017. 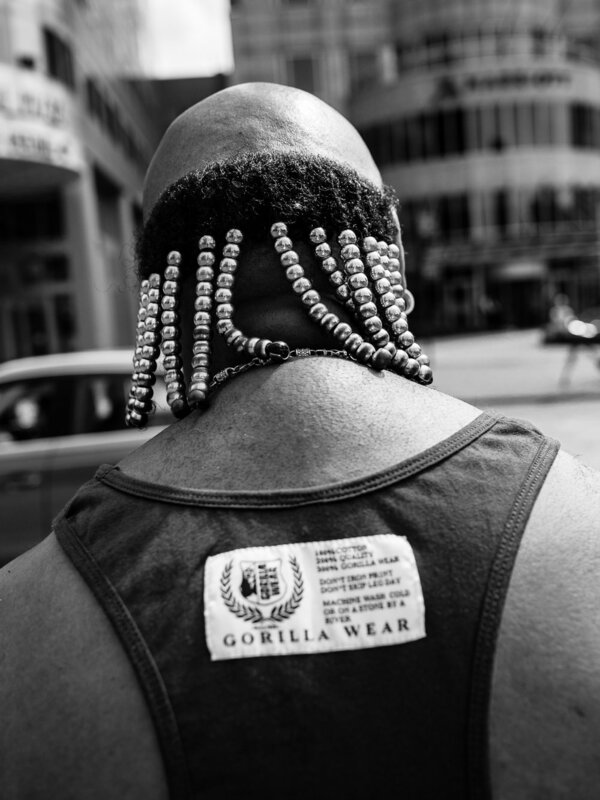 Due to bad personal circumstances I didn't get out much for street photography. The most pictures since May were taken during my workshops. Also this one. I like street artists most when they are not performing. This guy just has a break . I immediately recognised a contribution to my Undercover series. I consider this photo as one of my best of 2017. Photo taken in Zwolle in July 2017. Zwolle is my home town, but I didn't take much time so far to walk around. It's actually a very nice "Hanzestad". Nice people, nice shops and very nice dogs. Another one for my Street Dogs series. Photo taken in Amsterdam Rembrandplein in July 2017. I had a meeting with other street photographers, all part of the Facebook group Streeteyes. It was fun talking and walking with other passionate photographers. Not easy to shoot bubbles as they moved fast in the wind or were destroyed by the kids. I very much like the expressions and balance in this photo. Photo taken in Rotterdam in June 2017. Street portrait with permission. He was having a smoke and was kind to sit for a couple of minutes. I took a couple of photos and liked this one very much. Shot with Olympus OMD1 Mark 2 and Olympus 25mm f/1.2. Wow, what a great lens for portraits! Photo taken in Rotterdam in June 2017. The minute he dived away from the window I knew that I had a new contribution to my Undercover series. I already had seen the lines on the tram that would complete this image. Photo taken in Rotterdam in May 2017 during a workshop I teached. I had some help from one of my participants who stepped into the tram to take a picture of this woman. She smiled very friendly and I like this shot. The rain on the window is always a bonus. Photo taken in Leeds in May 2017 during a business trip. I had a day off and visited Leeds. I saw this poster and was looking for the right person to enter in my frame. I returned a couple of times and saw this guy waiting. Sometimes you just have to wait when you see a good opportunity. Conceptual street photography I call this. Photo taken in Amsterdam in April 2017 during the fun fair on the Dam Square. I wouldn't take my dog to a fun fair as they hear much better than human beings. It was very very noisy. The dog doesn't seem to care though. I liked the way he was standing on the shoes of his owner. Of course I added this dog to my Street Dogs series. Photo taken in Rotterdam in March 2017. Sometimes I make street portraits with permission of the model. This guy lives in Emmen but was born in Rotterdam. It was a long time since he visited Rotterdam and he told me that he got quite emotional touching the Rotterdam ground again. His name is Eddy Tijssen. His colorful clothes and his friendly open face caught my intention. Shot with Olympus OMD1 Mark 2 and Olympus 25mm f/1.2. The 25mm is perfect for this kind of portraits. Look how sharp it is! Photo taken in Rotterdam in March 2017. I often make photos of elderly people. I do this intuitively. Their faces show the live they have lived. I also like to see young people but somehow they don't appear very often in my images. 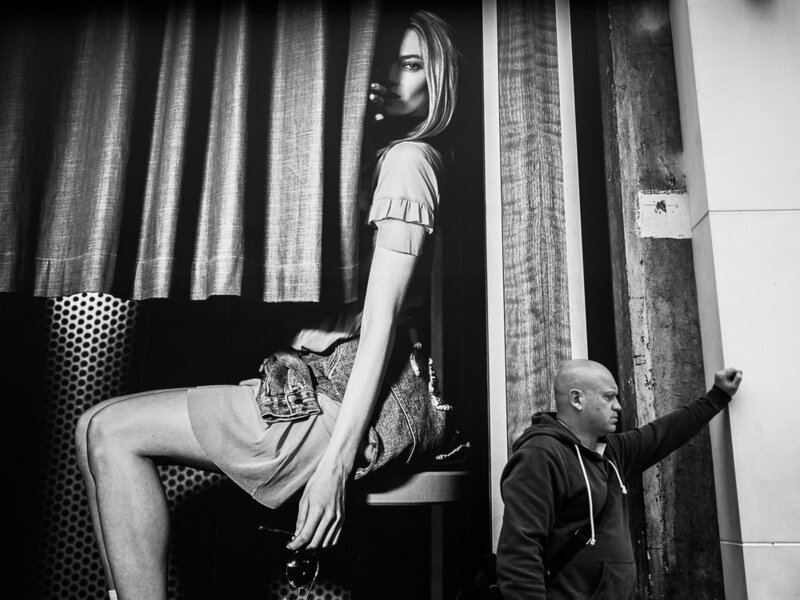 Shot taken during my workshop street photography in Rotterdam. Endless possibilities to make photos of people behind glass in trams, trains, buses and restaurants. Be aware of your own reflection when you shoot at 90 degrees. It's safer to choose a slightly different angle, preferable to show the face of your main character. The "Huishoudbeurs" (Housekeeping Fair) in Amsterdam is a place where 95% of the visitor are female. You can find all kinds of products and services that you can use in the household. It's fun for street photographers too to visit these kind of events. You can see female friends and also mothers with daughters. As you can see it can be quite boring or tiring. Click here to see a selection of my visit in 2016. I like to make photos of street dogs. Street dogs are often with their owner and I always try to show the connection between the dog and the owner. Cats are most often alone on the streets. This one was an exception and he/she was curious what I was doing. The sun was setting very fast and I didn't have much time. It was crowdy and difficult to shoot an isolated person. Then she arrived and I was in time. I like the sun in her hair. I saw this lady when I walked around in Berlin. She was moving quite slow and I took some photos of her. I am not sure if she saw me or that she just didn't bother. Shot taken at the Central Station. Endless possibilities to make photos of people behind glass. I guess this Glassy series will never end. I always join the participants of my street photography workshops to shoot through glass barriers. In this case I was happy to see this guy behind a steamy window of the tram. Part of my Glassy series. Shot taken at the back side of the Central Station. I showed some participants of my workshop street photography how to deal with the reflections. The camera can't see through these windows so you can use your body to frame the shot. Part of my Glassy series. One of favorites of 2016. Shot taken on the Oudegracht. Never seen a "naked dog" in real life before. You are very welcome to my Street Dogs series. Shot taken from the Oudegracht.. When I saw this woman hidden behind the plant I immediately recognized a new photo for my Undercover series. Shot taken in the "Koopgoot' in Rotterdam Centre. Actually showing some participants of my workshop street photography how to approach a scene with a low point of view. Shot taken at the Schouwburgplein in Rotterdam Centre. First I thought the woman was having a baby in her arms. A closer look showed her carrying a doll. 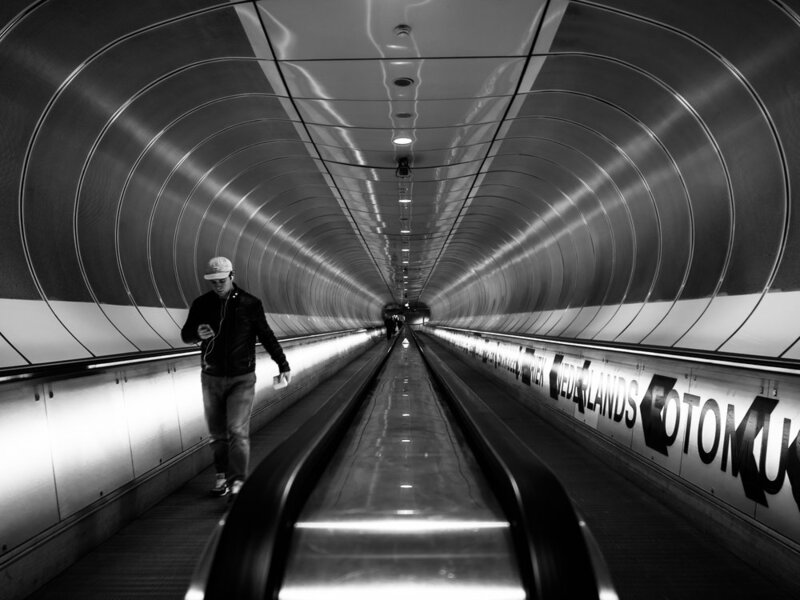 Shot taken at the Central Station in Rotterdam Centre. Love to shoot street dogs. With the 8mm Fishye lens you get a lot of the environment in your shot. Shot of the famous "Markthal" in Rotterdam Centre. Amazing how close you can be at such a big building and cover it completely with a Fisheye lens. Shot taken during the Obstaclerun in Zwolle at the "Milligerplas" just near my house. The participants are running on a 9 km track and find 8 obstacles they have to take. Here they climb on a slide where they jump into the harbor of the Milligerplas.